The April Medical Monday event features Reid Health’s Injury Prevention Coordinator Jacob Cox, who will discuss and train attendees in a program aimed at saving lives in emergencies. 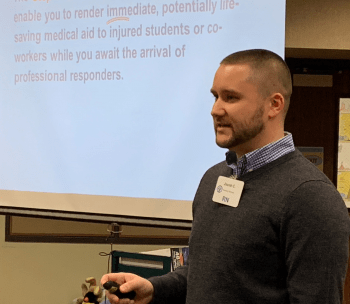 Cox, RN, with EMS and Trauma Services at Reid Health, has shared the program with staff in area schools and state officials at the Indiana legislature, among other groups. The program is designed to save lives by helping people learn how to quickly stop life-threatening bleeding. With a serious injury, a person can bleed to death in less than five minutes -- often before trained emergency help can arrive. Cox notes studies have shown that 30 to 40 percent of the victims in mass casualty events died from rapid blood loss. Medical Monday is a free presentation and will begin at 1 p.m. Monday, April 8, at Central United Methodist Church. To attend, please RSVP Sharrie Harlin at (765) 983-3000, ext. 4676. The church is located at 1425 E. Main St. in Richmond. Medical Monday is supported by Reid Health Community Benefit.